Lemon curd- Hello everybody, welcome back with ZetiraKitchen! 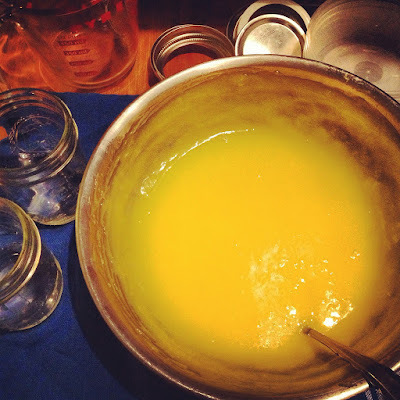 Today I will share about how to make homemede lemon curd with easy recipe! Lemon curd is the best spread for cookies, biscuits or your baked food.You can find in many market.Creamy spread that's made with cooking together lemon juice, egg yolks and sugar. Fresh lemon juice and sugar provide the flavor of the curd and the egg yolks serve to thicken up the mixture when it cooks. In other recipe also added the butter to the finished curd for richness flavor and an extra-silky mouthfeel. Lemon curd has a bright, sweet-tart lemon flavor. You can modify the citrus flavor with fruits, such as raspberries and strawberries, to your curd recipe. Prepare the large saucepan then put lemon juice, lemon zest, sugar, eggs, and butter. mixed them. Set the stove with medium-low heat about 6 minutes. Cover the lemon curd with plastic wrap and reserve into refrigerator. Your lemon curd will be durable.